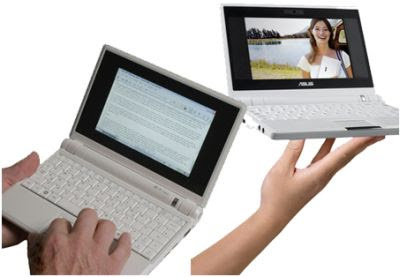 Just a month after Asus first released the Eee PC 4G in the US, it looks like the company is ready to start pumping out some new variations, including a black model and the higher end 8G. The 8G is pretty much identical to the 4G, except it has 8GB of solid state memory instead of 4GB, and 1GB of RAM instead of 512MB. Oh yeah, and it costs $100 more. If you’re willing to void your warranty, you could upgrade your RAM pretty easily on your own for less money. But increasing the storage capacity would take a bit more work, so this seems like a reasonable price. Still, somehow a $500 Eee PC just doesn’t seem as appealing as a $400 model. In other news, at least one retailer seems to be selling the 4G for $299. I’ve never heard of this company, I’ve never bought anything from them, and I wouldn’t recommend you do so either unless you know someone who has dealt with them in the past. At $299, I can’t imagine anyone is making any money on this deal, so it sort of feels like a scam. If you have reason to believe otherwise, please let me know in the comments. Regarding the outfit offering a $299 Eee, I was taught a very useful piece of advice early in life: "If it sounds too good to be true, it probably is!"